Hares are mostly solitary. They don't have a permanent home but move about the countryside, sleeping where they can find camouflage. At certain times of the year, especially in the spring and summer, they will gather in large numbers to mate and play. A group of hares is called a "drove." 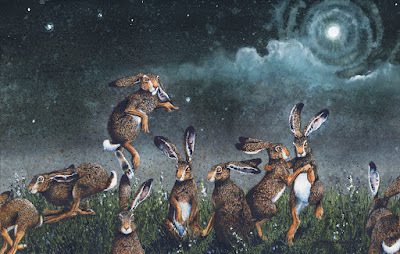 Image: "Moondance" by Maggie Vandewalle.